I have been moaning forever at the failure of the Press to communicate clearly. I ponder here if that is our fault as much as theirs. What is a free press? What is good about this? • none of these but something else entirely. Is any newspaper or its equivalent a document of record, as the (London) Times used to be? Have we always had a bias in reporting? What are the rules for what can be published in this way? Having just received the referendum result and now living through the repercussions of that decision, which history will describe as living in interesting times, I am moaning at the failure of the Press, the fourth estate, to communicate. The basis of my complaint is that we were required to make a decisive choice; ² in order to do that many Britons complained when asked that they were very confused, that the information they were being bombarded with was confusing and that there seemed to be no hard facts anywhere at all. But surely this is exactly what the Political classes and the Press are there for, to make sure that the electorate does understand what the issues are? Yet, as the date drew closer the complaints of confusion stayed at much the same level. Writing this as modern history, we had a number of proven lies from the Leave campaign. Top of the list was the figure of £350M a week going to Europe, writ large upon the leave campaign bus. The New Statesman wrote about this, but takes no responsibility for encouraging the situation. I have been wondering how this advertising doesn’t result in legal action and discover today from the ASA themselves: For reasons of freedom of speech, we do not have remit over non-broadcast ads where the purpose of the ad is to persuade voters in a local, national or international electoral referendum. Complaints about political advertising should be made directly to the party responsible for that advertising. Source. Notice that complaint will give you no recourse; the ASA does not say you will have any official support from any source in complaint over an untruth. 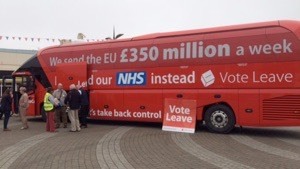 So apparently you can imply that a vote for Leave will move £350M to the NHS, every week. even as you know it is untrue. We know we would like to move around six months’ worth at least once, but it doesn’t say that. Nor does that slogan address the case why it is that we can’t fund the NHS with the funds we do have. [Answer; our national demand for health care is more than we can afford – we need to moderate our expectations]. Similarly, the very tempting “Take back control”, especially of our borders, does not actually promise to cut immigration, though that is what we all thought we heard being said. It is quite amazing how the many things we were told in the far-too-many weeks before the referendum are now followed by being told “We didn’t say that”. In this electronic age, we should be able to demonstrate exactly the opposite. Of course, being politicians, we have sadly, come to expect them to go back on what we thought was a promise. In the modern way, the person challenged at interview says, often correctly, “I didn’t say that”. So someone else associated with the campaign did, and because no-one ever says in public “Hang on, that’s too much”, we all conspire to be duped into belief. And dispiriting disbelief later. Why are we so stupid as to fall for this time after time? ³ How is it that the press, with far better access to information than us—the fallible, gullible people—apparently conspires to perpetuate this situation? Which begs the question: whatever a free press was, do we still have it? I suspect that the answer is, not in print media. Indeed, I see parallels with the 1630 situation and wonder if the internet and in particular social media sites are the new ‘free press’. More on this at another time. The Independent also looked at this situation far too late, i.e. after the event. They list the messages we received, but don’t identify sources, so while I’ll agree this was what we felt we had been told, I’m still not sure we can track blame to anything concretely seen as the Campaign itself. Yet is seems to me that, right this instant, that is exactly what we need, for those same people are about to waltz into power, having apparently, successfully lied. It may be that those who sat on the fence—or who kept relatively quiet—are the ones lumbered with resolving the subsequent mess. . Yet, I wonder, while this makes great reading at the time, does it achieve anything more than the bleat, “How could we be so stupid?” Well, we have been and now we must make the best of the situation. Move on, people. The political repercussions will run for a long time but already we can see several gaping holes in our society that need attention. I mean they have needed attention but now that it is more obvious, perhaps more people will be interested in a fix. I’m sure a similar fraction will simply decide to have nothing more to do with such matters. Yet one of the repeated mantras of both campaigns, possibly one of the few things on which both sides were agreed, that we need a thriving economy to make ‘progress’. A thriving economy is not created by withdrawal. There’s a separate discussion to be held why we might need perpetual growth, where I suspect that the answer is that it is the only way we can pay for the promises made; far too many promises depend on there being more money later. There’s a second disaster here, that the politicians were being told that there was a high level of confusion, but failed to relieve that problem. In so doing, they have, as a body, done nothing good to engender trust and so they have done themselves no favours. Personally I see the press as being largely at fault, but given that they are constrained by the new laws, passed by the same politicians, then they, the politicians, have a situation only they can fix and that they should be talking about. If the press will let them. Which is both circular and not helping. Example: we have been successfully lied to. Again. This ought not to be happening. • The electorate might wake up and do its due diligence in research en route to making up its mind – in a sense we could have more of the electorate taking responsibility for casting a vote sensibly, by their own lights. That might be reflected in a far higher number of people involved in political activity. • Politicians may wake up to the fact (sad, but true, a fact) that they failed to communicate to the electorate and do something (anything, please, but not nothing) about that. • We need falsehoods to be challenged, but, instead of ruining the media with argument, what we need instead is some attempt to understand what are often quite complex situations. So long answers (which are also demonstrably true, clearly separating fact from opinion) must be available. • We need some sources with which both sides to an argument can agree to accept. How is it that we really can’t account for our financial interaction with Europe? We surely know how much we send in that direction and how much comes back, under a long list of headings. Can you believe that ‘we’, somewhere, do not know this? Then why was this not shared information that both sides, and we ourselves as people challenged to make a decision, could look at, and question? It turns out that this makes an essay on its own, contained within three; essays 258, 259, 260. • take advantage of the political awakening of the population and turn that into being more representative and inclusive in politics (lower case required, please: a majority of us have an MP for whom we did not vote, but that is still your representative in parliament and both you and they must recognise this situation and work with it). So I maintain that the press is the enemy because it is failing to make communication occur, when it is being relied upon to do just that. How is that opinion possibly valid? Well, let’s start from asking what the Press does in its role as the fourth estate. I say that it is to inform. I recognise that every paper shades each partial truth in favour of what it perceives as its readership. In an environment where the paper medium is struggling to stay in business, that might push that opinion-shading to extremes. The television and radio medium spends a lot of time—as regards news—reporting what the paper press is saying. This wonderfully confuses fact with opinion, which has been a lot of our immediate problem. So the transmission media fall into the same trap, largely echoing the paper media. Both of these are challenged to provide ‘balance’. Article from 2012 Economist. See also Flat Earth News. The voluntary regulatory body is the IPSO, It [the code] balances both the rights of the individual and the public's right to know⁵. In particular, iv) The Press, while free to editorialise and campaign, must distinguish clearly between comment, conjecture and fact. Which brings us to fact: Michael Gove said yesterday <this>. Nigel Farage said <that> from which we conclude (hint, opinion coming) that the Leave campaign is telling us <extension, shaded by opinion>. This is within the rules. It does not claim that, nor is it required to test whether, Gove and Farage each told a truth, it must only report them accurately. So not only is the misleading slogan on the Leave bus free of censure (at law), the press is in no way required to ascertain the truth of the things it reports, only that it has reported accurately. So it is ruled that honest behaviour is that <source> said <statement> but no test of the validity of the statement is required. Which would explain the Press general behaviour to try to extract steadily more extreme statements, which of course immediately reduces many ‘interviews’ to fights to not say stuff. It would be more constructive (but we don’t do constructive because destructive is so much more fun) to allow people to say nothing (because nothing useful can be said, to admit that and move on to finding something that can be said. This unhelpful but accurate behaviour, say I, is not what we need the press to be doing – well, we do need them being accurate, but we also need some validation of what it is that is true. What I want to see is a bigger physical gap between fact and opinion, when, in pursuing only accuracy, we have instead more blurring and less clarity. Of course, we are told that the objective of the press is to sell papers. I suggest that it is time that this changed. I’m not buying a paper that is not telling me what I need to know, even if that information is filtered. I have no problem with being told by such an organ to go read for myself, but more and more I want the news with the sources quoted (yes, the press must protect its sources, but does that include sites they visit? Am I in breach by quoting where I garner an opinion or putative fact? I’m trying to tread a line—or bridge a gap—between what I view as the crap of academia and the lack within the news media⁷. I am not buying (not prepared to buy, unwilling to spend money on) a paper that tells me what to think, nor am I entirely happy reading stuff that is so close to what think I’m led to agree without my doing any thinking (which is too close to the same as being told what to think). Reading something with which I disagree—just enough—causes me to explore, to think for myself, and so I’d like to see links to places where I might explore further. That is not yet happening on the electronic versions of newspapers. If you have found one, please tell me. Worse, since we learn from the Trump and the UK EU referendum campaign that the truth doesn’t work (1, 2, 3), we have ourselves in a real bind. “There was a time, not long ago, when we would differ on the interpretation of the facts. We would differ on the analysis. We would differ on prescriptions for our problems. But fundamentally we agreed on the facts. That was then. Today, many feel entitled to their own facts.” Marty Baron, Exce Ed of the Washington Post, early June 2016 at Temple University, USA. [3, above]. This is how Boris can talk about us being flooded with Turkish refugees, when we know (or should) that Turkey won’t be joining the EU in thirty years, But no senior politician can say that (“Turkey won’t be joining at all and certainly not soon”) because Turkey doesn’t want to hear it, and if it did would have to respond – there’s some sort of gentlemanly political understanding that we continue to dangle the carrot, they continue to drift slowly in ‘our’ direction and we want what that drift means, not what the joining means, simply because the EU cannot have such a long almost-open border with Iraq and Syria. But the press in general will not sensibly leave that unsaid, they go chasing the killer quote. Why? For the same reason that a politician goes for the kill when given the chance; it provides short-term personal advantage. Both the politician and the reporter ‘go for the jugular’ in the hope of marginal improvement in their individual personal prospects. So what is wrong is not just the individual action but also the system that encourages this selfish performance. In the corporate world, this would be called unenlightened behaviour. 1. On Twitter this morning, I saw this: ‘Of course not all Leavers are racists. That would be a terrible thought. But all racists now think 52% of the population agree with them’ (I was going to amend this slightly with square brackets, because 52% of the people that voted voted Leave, not 52% of the total population, but on reflection I’m going to let it stand). 2. Mervyn King said in an interview on The World at One that he thought people didn’t want to be told what the former head of the Bank of England thought about Britain leaving the EU, but rather wanted some proper facts and figures so they could make up their own minds. He then refused to give his view either way, saying it would take at least two hours to give a properly balanced answer (‘Please’, I shouted at the radio, ‘give him two hours of airtime to do that, then!’). 3. Me: Is there a box for ‘I’m voting to remain, but I also want it to be understood that this should not be taken as an endorsement of Cameron and George Osborne in any way’? Man in Polling Station: You’re the fourth person to make that joke today. Man in Polling Station: I’ll get the Special Pencil. Is there a future for the social media in this mess? So far I’m seeing that as a great way to vent to one’s friends and ‘friends’ on Facebook, or Twitter or whatever grabs your attention, but one is often a good deal further from any truth by virtue of being very much closer in terms of immediacy, to real life vehement opinion. Join a chat room and it rapidly hits a lowest common denominator (demoninator, I wrote, perhaps accurately) from someone less articulate and reasoning or reasonable. Indeed, such measures are relative, so what I think is balanced may well be close to trolling to others. But this is also far from the truth, except on those occasions where someone is helpfully providing links to things they found useful or which they feel is relevant to the case they are arguing. This I find very healthy and often eye-opening. In practice, it is no nearer to finding any truth, but it does make you inspect your own opinion carefully. Perhaps the future sees us using tools to find out what is so. Perhaps the future will only serve us up the perceptions of others and never a truth. In which case, beware the one-eyed man quite as much as anyone else who wishes to be king. Or, in our case, for the next few weeks, Prime Minister. Re-reading many earlier essays while applying the new thinking on use of en-dash, I see that Essay 174 has some of the same thinking expressed a year earlier. And 20160804 I have changed many en- and em- dashes in this piece. Did I change my mind, again? Review required. 1 Which does not automatically mean that a press controlled by someone is not free. 2 The question was whether or not one wished to Remain or to Leave the European Union. 72% of the electorate voted, 52% said Leave. Locally, Scotland said Remain, but in England, which is far more populous, 54% voted Leave. At the time of writing, the PM has resigned, the most likely candidate to take his place within the parliamentary Tory party, Boris Johnson, has just been rubbished by his lead Leave compatriot, Michael Gove. Meanwhile the Labour party seems to be trying to run a distraction and is rubbishing its own leader. The EU parliament is adamantly and clearly utterly disinterested in any reform and I suggest that this attitude is what pushed so many over the edge. However, while it is easy to read what it is that this vote says and who said it, no such thing can be true, since there is only ever one question put and no other information is collected directly. It would be perfectly easy to have an optional ancillary paper to respond to; it would be perfectly easy to ask several questions; it would be perhaps helpful to know that (majorities of) the over-50s voted Leave while the under-30s voted Remain, to know that (a majority of) those with degrees preferred to Remain (and those who left school at 16 or 18 to Leave). What we have is ‘definite’ information produced by merely overlaying voting districts with demographic data and seeing a correlation. Proof it is not. The surveys predicting results had the difference within their error margins, which kind of rubbishes their worth. Correlation might be evident, but causation is not. Essay 232. It is indirect evidence, so it may be that many older folk actually voted remain, but what they’d had to say to their neighbours, since these are the same people who voted to Join in 1975 (and are still living) might be enough to change opinions of the younger folk nearby. We don’t know. If we wanted to know, we could have arranged this. Quite easily. 3 The term is gas-lighting. to manipulate (someone) by psychological means into doubting their own sanity. From the 1938 book, Gas Light and the George Cukor film version in 1944 (Angel Street in the US). 6 I have failed to find any such reference in support of this, so balance is clearly not the word in use. This was as close as I found. The word seems to be impartiality. 7 ‘academic crap’; that requirement to quote absolutely every fraction of fact by source, thus largely disallowing inference, original voicing of experience and indeed apparently demanding your own words without permitting any of your own content in your own words. Deemed by me to be crap. For instance, when writing PGCE essays, my then 15 years of teaching experience was denied voice, whereas I was allowed and encouraged to copy the words of others. I noted that my published words were discounted as equally as the stuff already disallowed. ‘News media lack’ is the other extreme, quoting opinion muddled with fact without declaring much of either. The press has a right and need to protect sources, but publicly offered sources is not what the rules are designed to protect, so all that the press does is aid its apparent campaign to fudge all issues. Hence we have Gove saying “the electorate is tired of experts”, probably true, converted somehow from ‘some experts have been wrong’ to ‘all experts are always wrong’ (and, left implied, so that is why we are all going to ignore all of them except the one who says they were wrong). Essay 235. So what bugs me is that the experts are found to present opposing views; when that happens, are they still experts or have they instead become fortune tellers? Are they too confusing fact, experience, opinion and hairy-assed guess? To what extent—and here the press is pretty good at pointing to faults—is an ‘expert’ instead voicing a representative voice based on who provides the funds? Again, then, they may be expert but their voice is biased and not independent. We are getting close to a point where people pay the press to have their voice heard, when what we need is the voice of reason to be discovered and aired. In some spheres of media, I suspect we have already reached it; think of the music industry.